Trying to find the right cut out people or person for an architecture project (often under pressure) can be a very time consuming process, especially when they need to then be placed and given the correct lighting and colour in order to blend into the drawing. Cut out people create an illustrations narrative, and provide the viewer with a relationship and connection to the place and space. How a person is blended into the images environment is obviously very important, and there are many tutorials (such as the video below) that help you to do this. However it is the chose of person and the activities they are performing that really brings an image to life. …and this includes showing a the full range of ethnicities and cultures. Here we have pulled together the best websites that we feel supply a full and divers range of cut out people (for free), in a variety of different styles and graphics. As mentioned on their website "The goal of NONSCANDINAVIA is to give architecture students access to a database of free, high-res, PNG images that reflect diversity in all its forms.” It aims to provide cut out people that are ‘NON SCANDINAVIAN’ and therefore provides an alternative entourage to several of the larger sites and data bases available, such as the below Skalgubbar. They rightly believe that "renderings should reflect the people in and around the site, and should project a future that values diversity and acceptance of all people.” Which in most occasions requires carefully selecting people that are bespoke to your project and its context, there is not a one size fits all …and not everyone is from Scandinavia! 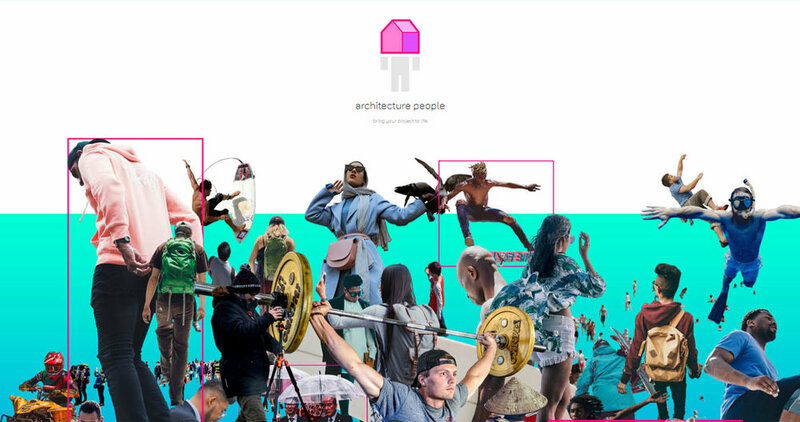 ‘Architecture people’ supplies a huge array of cut out people doing just about any activity you can think of, from a range of different views, under a vast array of settings and lighting conditions. Unlike many other websites they provide cut out people from all angles, including hard to find aerial perspectives, plan views and shots from beneath looking up. Skalgubbar doesn’t need much of an introduction as it is one of the most popular cut out sites available and as nonscandinavia.com suggests, it is full of Scandinavian young and ‘hip' people doing all sorts of interesting things, which combined with the other sites on here its a great resource to know. Mr Cut Out has a variety of free and paid for cut outs that include people, vehicles, objects, vegetation, animals, skies and foregrounds, so although not completly free of charge, there is lot to choose from. Inspired by and much like SKALGUBBAR with its Scandinavian themed people, Escalalatina is a growing open source collection of cut outs of Latin Americans. 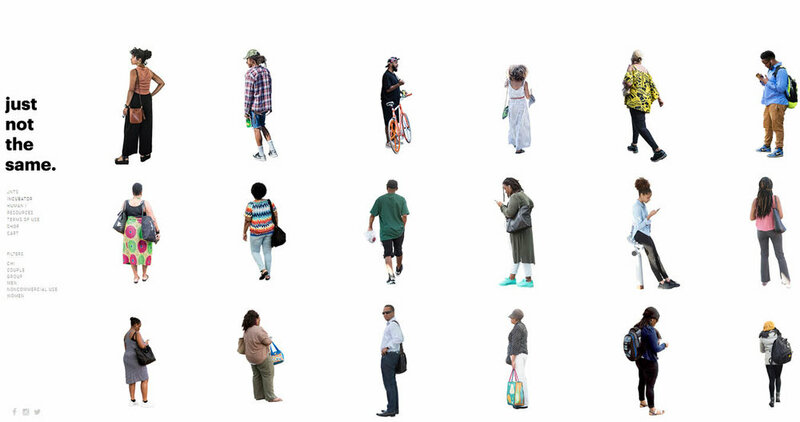 'Just not the same' has a large array and mixture of cut out people from all walks of life and during all the seasons, and offers high resolution cut outs via its shop. Following the trend of ethnic and culture based cut out people, Jugaad is a free resource for Indian entourages. 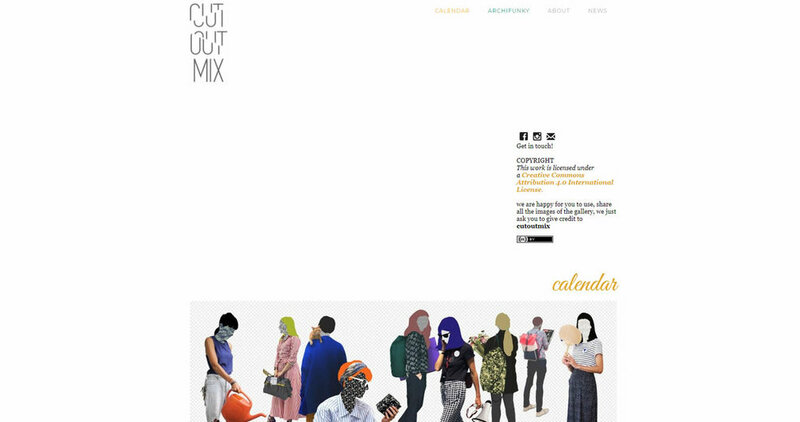 Cut out mix "promotes an artistic and experimental approach to the amazing world of silhouettes for architectural and design projects.” Offering an alternative way around any potential copyright infringement, by removing the cut out’s identity altogether. This a growing resource with a free catalogue and a custom made service. Clipped is an image sharing community aiming to be the largest database of cutout images in the world, and used together with the above websites, is the last and final cut out resource on our list.